We all have goals for our lives and dreams we want to achieve. JJ's message helps people realize their opportunities for greatness and gives them the tools, strategies, and principles needed to accomplish their goals and turn their dreams into reality. "Seize Your Opportunities" focuses on the individual and what one must do for success. 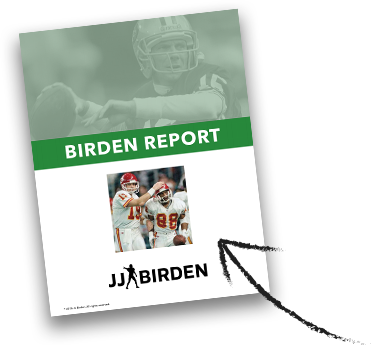 As a former NFL wide receiver, JJ knows what it takes to reach the highest level of performance and have the capacity to maintain it. Many of the success principles he learned as a professional athlete have helped him make the transition into the business world. Plain and straightforward, if you have goals, dreams you desire to seize in your life, you have to get them. Success is not going to be given to you. You have to achieve success. JJ Birden explains how. Every day we are faced with decisions that affect our performance, confidence, our belief, and our ability to keep moving forward. JJ's job is not to tell you how to do your job, but to give you principles to help you decide and act in a way that you can always lead and perform at the highest level. In this presentation, JJ shares his 8 Ps of Leadership & High Performance, actionable steps that can immediately improve your relationships, self-confidence, and ability to make the most out of life's opportunities. "Seizing Your Opportunities Now and Into the Future" is geared towards younger audiences. The goal is to provide information to help youth recognize that success is within their grasp. However, with the common entitlement syndrome, many kids and teens need to be reminded that they have to earn success. In this presentation, JJ shares 10 success principles specifically designed for young people to make the impossible POSSIBLE. Looking for a Unique, Engaging Speaker? By giving context to his life — the story behind his glory — JJ shows how he came out on top using his principles of success, and how you can too. Learn how JJ can help make your next event an even bigger success. Get in touch with JJ and learn how he can tailor his message to deliver a presentation that will engage, excite, and empower your group. JJ is available to speak to your group. Learn more about his tailored keynote presentations or book your engagement now!